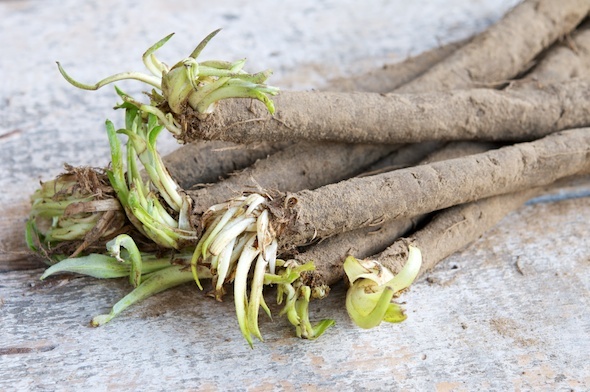 Black salsify is a very interesting root vegetable that we have been enjoying this winter. It is mild, reminiscent of white asparagus or oyster mushrooms. They are usually cooked by boiling and then served as a side dish, however we really enjoyed them on the crepes today. Fill a soup pot 1/2 way with water, a pinch of salt and a generous splash of lemon juice to keep the salsify from discoloring. Under running water, peel the salsify with a vegetable peeler. Salsify have a sticky, milky sap. But if you peel them under running water, you can prevent your hands from becoming all sticky. Even using surgical or plastic gloves becomes difficult as they get sticky. When peeled, cut the salsify in half and then slice lengthwise in half. Place the prepared salsify in the pot of water and bring to a boil. Once the water is boiling turn the pot down to medium and cook until the salsify are tender (about 20 minutes). Sieve the chickpea flour and Ap flour into a bowl then whisk together. Add the salt, sugar, sesame oil and water and mix well. Allow to set for 15 minutes then mix well again. You may want to add additional 1/4-1/2 cup water to thin the bater if it is too thick. While the salsify are cooking, and the batter is resting, prepare the sauce or filling. Place the soy yogurt in a medium bowl. Add the mustard, vegetable bouillon powder, salad herbs and splash of lemon juice and mix. Add the nutritional yeast and season to taste with salt, pepper, nutmeg and any other seasoning you enjoy. Heat your crepe pan. Once the crepe pan is hot, spray lightly with cooking oil. Pour 1/3 of a cupful into a well heated non stick crepe pan. Tip the pan to spread the batter evenly. Batter should have fairly thin coverage. Let the crepe cook until it is loose when you shake the pan. Flip with a spatula. Serve directly or keep warm in the oven while making the rest of the crepes. 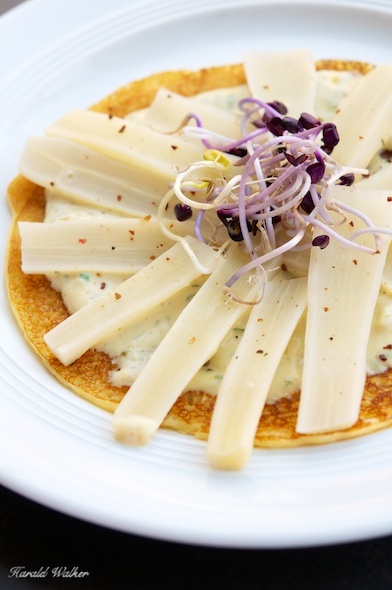 Spread some of the sauce on each crepe, add slices of salsify and a few sprouts. 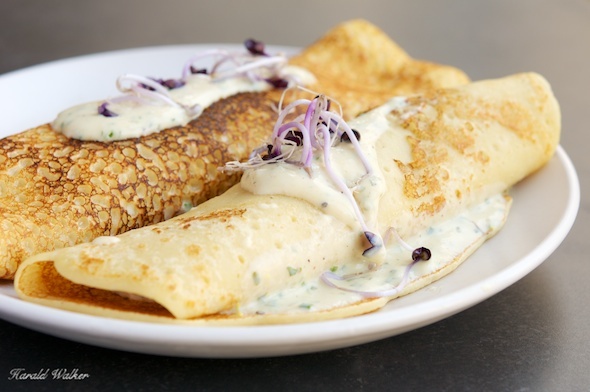 The crepes can be served, “open-faced”, folded in half as a half-moon, or rolled up. If they are served in half, or rolled up, spread a bit more sauce on top and garnish with a few more sprouts. Posted by Chris Walker on February 22, 2013 in Black salsify, Main Dishes.